Storybook charming, this barn-red Georgian Colonial welcomes you! 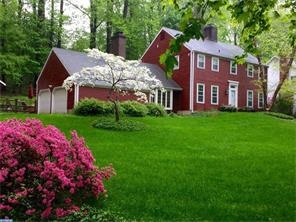 From the stone bridge entrance to the sunlit rms, this quiet retreat is minutes from Wayne and KoP. Step into this updated 4-bed, 3-bath home boasting modern amenities with period details: heated bathroom floors under marble tile, stainless appliances over wide-plank floors, front-loader washer/dryer behind a graceful Dutch door. Brimming with character, rooms feature shadow-box wainscoting, porcelain knobs and brass rim locks with skeleton keys. Enter through the center hall along the gleaming staircase and hardwood floors. To the right, the living room shines with double-hung windows overlooking Crow Creek and a lush garden of flowering plants. A brick-lined fireplace trimmed in slate centers the space under a crisp white mantel. To the left, an inviting dining room seats 12 and opens onto a gorgeous farmhouse kitchen. With white cabinetry, Pella casement windows, stainless appliances, granite countertops and a marble backsplash, the kitchen.